Nowadays, data is growing and accumulating faster than ever before. Currently, around 90% of all data generated in our world was generated only in the last two years. Due to this staggering growth rate, big data platforms had to adopt radical solutions in order to maintain such huge volumes of data. One of the main sources of data today are social networks. Allow me to demonstrate a real-life example: Dealing, analyzing and extracting insights from social network data in real-time using one of the most important big data echo solutions out there—Apache Spark, and Python. In this article, I’ll teach you how to build a simple application that reads online streams from Twitter using Python, then processes the tweets using Apache Spark Streaming to identify hashtags and, finally, returns top trending hashtags and represents this data on a real-time dashboard. Your new access tokens will appear as below. 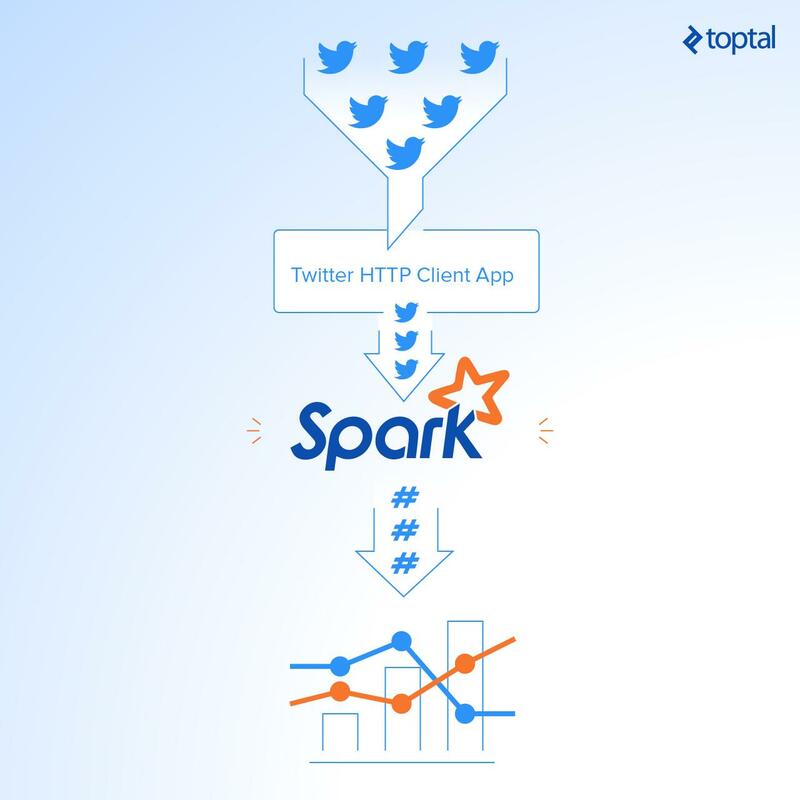 In this step, I’ll show you how to build a simple client that will get the tweets from Twitter API using Python and passes them to the Spark Streaming instance. It should be easy to follow for any professional Python developer. First, let’s create a file called twitter_app.py and then we’ll add the code in it together as below. Now, we will create a new function called get_tweets that will call the Twitter API URL and return the response for a stream of tweets. Then, create a function that takes the response from the above one and extracts the tweets’ text from the whole tweets’ JSON object. After that, it sends every tweet to Spark Streaming instance (will be discussed later) through a TCP connection. Now, we’ll make the main part which will make the app host socket connections that spark will connect with. We’ll configure the IP here to be localhost as all will run on the same machine and the port 9009. Then we’ll call the get_tweets method, which we made above, for getting the tweets from Twitter and pass its response along with the socket connection to send_tweets_to_spark for sending the tweets to Spark. Let’s build up our Spark streaming app that will do real-time processing for the incoming tweets, extract the hashtags from them, and calculate how many hashtags have been mentioned. First, we have to create an instance of Spark Context sc, then we created the Streaming Context ssc from sc with a batch interval two seconds that will do the transformation on all streams received every two seconds. Notice we have set the log level to ERROR in order to disable most of the logs that Spark writes. We defined a checkpoint here in order to allow periodic RDD checkpointing; this is mandatory to be used in our app, as we’ll use stateful transformations (will be discussed later in the same section). Then we define our main DStream dataStream that will connect to the socket server we created before on port 9009 and read the tweets from that port. Each record in the DStream will be a tweet. Now, we’ll define our transformation logic. First we’ll split all the tweets into words and put them in words RDD. Then we’ll filter only hashtags from all words and map them to pair of (hashtag, 1) and put them in hashtags RDD. Then we need to calculate how many times the hashtag has been mentioned. We can do that by using the function reduceByKey. This function will calculate how many times the hashtag has been mentioned per each batch, i.e. it will reset the counts in each batch. In our case, we need to calculate the counts across all the batches, so we’ll use another function called updateStateByKey, as this function allows you to maintain the state of RDD while updating it with new data. This way is called Stateful Transformation. Note that in order to use updateStateByKey, you’ve got to configure a checkpoint, and that what we have done in the previous step. The updateStateByKey takes a function as a parameter called the update function. It runs on each item in RDD and does the desired logic. In our case, we’ve created an update function called aggregate_tags_count that will sum all the new_values for each hashtag and add them to the total_sum that is the sum across all the batches and save the data into tags_totals RDD. Then we do processing on tags_totals RDD in every batch in order to convert it to temp table using Spark SQL Context and then perform a select statement in order to retrieve the top ten hashtags with their counts and put them into hashtag_counts_df data frame. The last step in our Spark application is to send the hashtag_counts_df data frame to the dashboard application. So we’ll convert the data frame into two arrays, one for the hashtags and the other for their counts. Then we’ll send them to the dashboard application through the REST API. 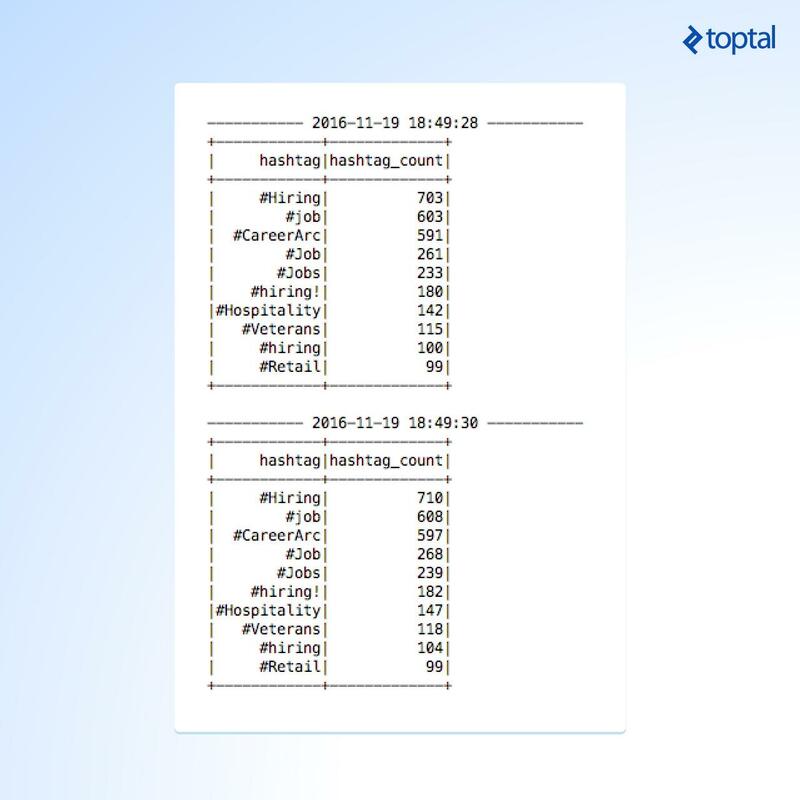 Finally, here is a sample output of the Spark Streaming while running and printing the hashtag_counts_df, you’ll notice that the output is printed exactly every two seconds as per the batch intervals. Now, we’ll create a simple dashboard application that will be updated in real time by Spark. We’ll build it using Python, Flask, and Charts.js. First, let’s create a Python project with the structure seen below and download and add the Chart.js file into the static directory. Then, in the app.py file, we’ll create a function called update_data, which will be called by Spark through the URL http://localhost:5001/updateData in order to update the Global labels and values arrays. Also, the function refresh_graph_data is created to be called by AJAX request to return the new updated labels and values arrays as JSON. The function get_chart_page will render the chart.html page when called. 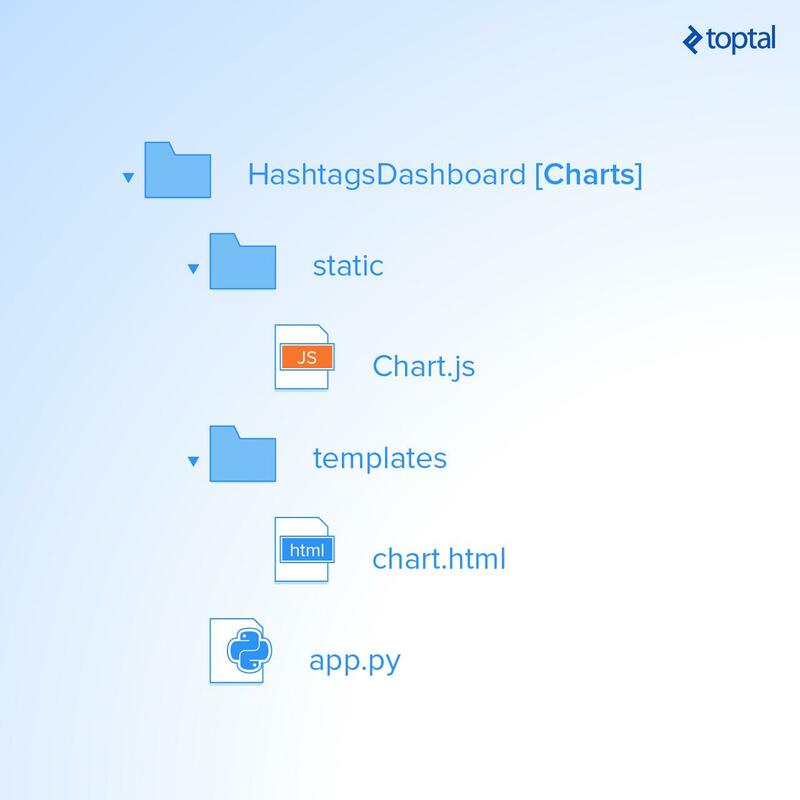 Note that the data’s labels and data are bounded with labels and values variables that are returned while rendering the page when calling a get_chart_page function in the app.py file. The last remaining part is the function that is configured to do an Ajax request every second and call the URL /refreshData, which will execute refresh_graph_data in app.py and return the new updated data, and then update the char that renders the new data. Let’s run the three applications in the order below: 1. Twitter App Client. 2. Spark App. 3. Dashboard Web App. We’ve learned how to do simple data analytics on data in real time using Spark Streaming and integrating it directly with a simple dashboard using a RESTful web service. From this example, we can see how powerful Spark is, as it captures a massive stream of data, transforms it, and extracts valuable insights that can be used easily to make decisions in no time. There are many helpful use cases that can be implemented and which can serve different industries, like news or marketing. 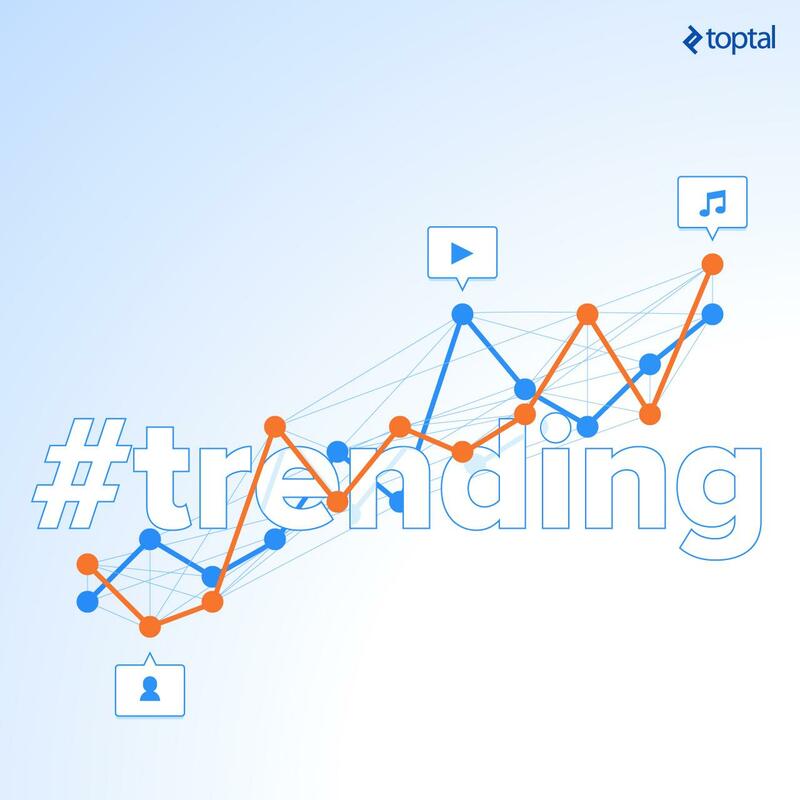 We can track the most frequently mentioned hashtags to know what topics people are talking about the most on social media. Also, we can track specific hashtags and their tweets in order to know what people are saying about specific topics or events in the world. We can collect the stream of tweets and, by doing sentiment analysis, categorize them and determine people’s interests in order to target them with offers related to their interests. Also, there are a lot of use cases that can be applied specifically for big data analytics and can serve a lot of industries. For more Apache Spark use-cases in general, I suggest you check out one of our previous posts. I encourage you to read more about Spark Streaming from here in order to know more about its capabilities and do more advanced transformation on data for more insights in real time using it. 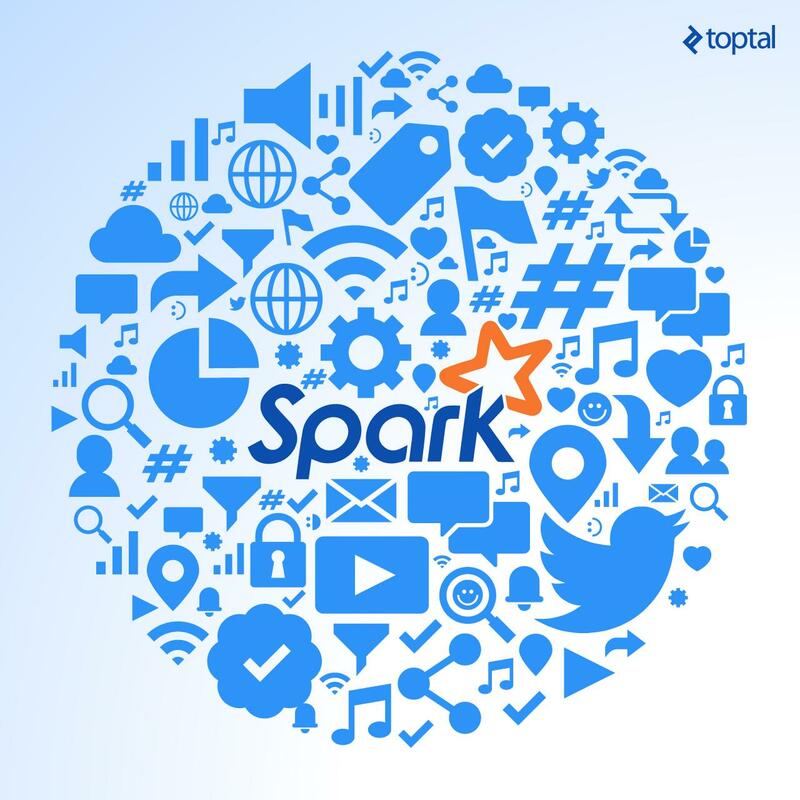 What does Apache Spark do? It does fast data processing, streaming, and machine learning on a very large scale. It can be used in data transformation, predictive analytics, and fraud detection on big data platforms. 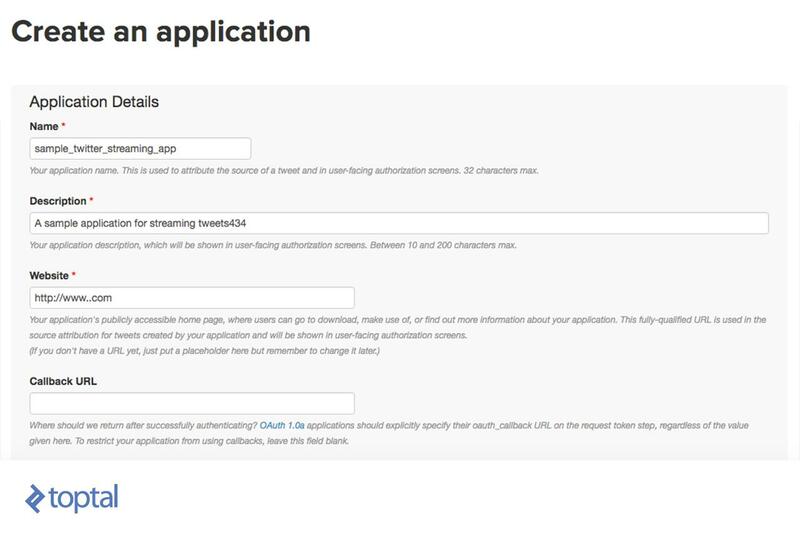 What is a Twitter API? Twitter allows you to get its data using their APIs; one of ways that they make available is to stream the tweets in real time on search criteria that you define. Do you have this code on github or somewhere ? I wonder, why didn't you use reduceByKeyAndWindow(). You seem to accumulate counts for the entire history the job was running, while "looking through a window" is clearly better in the long run. You'll get "most popular hashtags in the last, say, 24 hours". Hello Vikas, Sorry the code it not uploaded on github, but I'll upload it an share it with you. Hello Vilo, Yes you are right :) it will be the same result. But I just wanted to introduce the feature of the Stateful Transformation to the readers with a small example. Hi, I am consuming rest api that you have mentioned in your post. But the problem is that i am getting only 20 records.? I am not able to understand why it is happening. Does it return only 20 records? hey, Angel H, did you manage to resolve your problem? I'm getting the same error. Thank you! I'm sorry Grumăzescu, I actually paused this experiment. But if you find the answer please share it. I found the answer. Looks like a pass the wrong ACCESS_TOKEN, ACCESS_SECRET, CONSUMER_KEY, CONSUMER_SECRET. I passed them in an reverse order. Check again Angel H. Thank you very much Hanee, very usefull! Hi, I loved the idea and the use for Spark, Im tryting to test the app but I constantly get this error in the spark_app <class 'ValueError'> and dataframe never shows, any idea what it could be? what version of python and spark do you use? Hi! When i get to get tweets in Portuguese and with unicode json.loads(line, encoding='utf-8') the rdd does not accept, just give a Error: <class 'ValueError'>, and do not count the hashtags, how can i fix that? Thanks Hanee. It was very useful . Have a question though , we are iterating over each RDD in Dstream after stateful transformation-updateStateByKey........now a Dstream has multiple RDDs (one RDD per batch interval) , looks like are pulling the top trending hashtags at RDD level not at the Dstream level ..is that right ? Decode the response data before loading into json as it is in bytes and json expects object. And encode it back while sending through socket it will resolve the issue. Dstream.foreachRDD takes care of all the RDDs for each interval. You can also reducebykeyandwindow to avoid confusion. Hello Danillo Lange, Were you able to solve the error? Were you able to solve the error? I am getting <class 'valueerror'=""> and dataframe never shows, any idea what it could be? Wonder why you use Python? I hear that is not as fast as Scala or Java. Is there a possibility that Python doesn't keep up to the twitter stream? Other than that, I learn so much reading this! Awesome!